Uganda's parliament has voted to suspend all new deals in the oil sector following claims that government ministers took multi-million dollar bribes. MP Gerald Karuhanga said in parliament on Monday that UK-based Tullow Oil paid bribes to influence decisions. Tullow said it rejected the "outrageous and wholly defamatory" allegations. 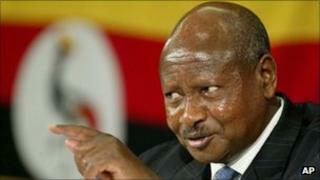 The vote is a big blow to President Yoweri Museveni, who has been in power since 1986, analysts say. The BBC's Joshua Mmali in the capital, Kampala, says it means the government will not be able to sign new oil deals until a petroleum law is enacted. During a heated parliamentary debate on Monday, Mr Karuhanga tabled documents alleging that Tullow Oil bribed Prime Minister Amama Mbabazi, Foreign Minister Sam Kutesa and former Energy Minister Hilary Onek. Mr Onek, who was accused of receiving about 17m euros ($23m; £15m), strongly denied the allegation. "I am thoroughly hurt by these lies because if such an account really exists I deserve all the punishment on Earth," Mr Onek told MPs. Mr Kutesa accused Mr Karuhanga of abusing parliamentary privilege by making false claims. "Is he in order to make defamatory statements against me which are false and well-knowing that he cannot repeat them outside this chamber," Mr Kutesa asked. Mr Karuhanga replied that he was prepared to repeat the allegations outside parliament. Mr Mbabazi read a letter to MPs from Tullow Oil chief executive Aidan Heavey. "These accusations are demonstrably false and appear to be founded on misunderstandings about how the global oil and gas industry works," the letter says. "Tullow would welcome the opportunity to appear at an appropriate forum in parliament to refute these serious allegations and to explain, with other representatives from the industry, how the industry in which we are proud to work operates." Our reporter says MPs demanded greater transparency in the oil sector and urged the government to disclose details of what they call secret deals with Tullow Oil. The company operates three oil blocks in Uganda's oil-rich Lake Albertine Rift. Correspondents say the parliamentary vote was carried with the backing of ruling party MPs, suggesting that Mr Museveni is losing his grip over them. Mr Museveni won elections marred by allegations of fraud in February. Uganda has been hit by a series of protests this year over the rising cost of living. Mr Museveni warned that he will not tolerate an Egypt-style uprising against his rule.